by a coalition of 3 largest political parties - Democratic Party of Japan (DPJ, ruling party), Liberal Democratic Party (LDP), and New Komei Party (NKP) - that make up 92% of the Lower House and 85% of the Upper House. In other words, the bill is guaranteed to pass and be written into law. The Democratic Party of Japan, the Liberal Democratic Party, and the New Komeito Party will submit a joint bill during the current session of the Diet that will allow the national government to collect and dispose the debris contaminated with radioactive materials from the Fukushima I Nuclear Power Plant accident to expedite the cleanup. The disposal of the radioactive debris after the Fukushima accident hasn't even started in the no-entry zone closest to the plant. The three parties have compiled a bill that will allow the national government to quickly dispose the radioactive debris. Under the bill, the national government would be responsible for collecting and disposing the debris in the highly contaminated areas [around the plant] as well as the debris outside such areas whose radioactive materials test above certain levels. As to the contaminated soil, the national government would be responsible for decontamination in the highly contaminated areas. 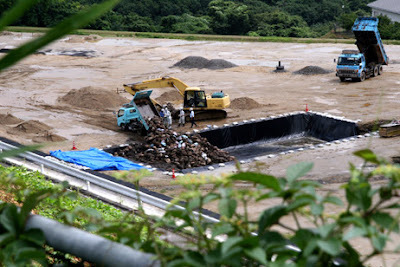 The cost for debris disposal and soil decontamination would be eventually billed to TEPCO by the national and municipal governments. The parties are planning to submit the bill this week and hope to have it passed during the current session of the Diet. Mix and match, dilute away and bury everywhere is what is going to happen. An increasingly pessimistic Hiroaki Koide says that's the price the citizens will have to pay for having allowed nuclear reactors all over Japan. Without waiting for the national government's decision, Fukushima City has already been secretly burying the radioactive dirt and sludge in a remote part of the town without telling the residents. Oh it's just temporary, the city official says. Asahi Shinbun broke the news in Japan on August 5 (Japanese print version only, buried on the page 35), but there's absolutely no follow up anywhere. Not a peep. Local Fukushima papers maintain total silence on the issue. If you go to the article, you'll read that some of these bags measure over 9.9 microsieverts/hour (the level was beyond what the portable survey meter could measure). I wonder how long the "temporary" period is going to last. Several decades, maybe. Politicians are good at kicking the can, everywhere. As Dr. Shunichi "100 millisieverts are safe" Yamashita, a good politician doctor, has said already, "I won't be responsible, because I'll be dead by then." This is par for the course in a country that has allowed the construction industry to destroy ever beautiful spot so they can build a highway, road, bridge, parking lot, community center, pachinko parlor, etc., in order to give people jobs. Radiation is just another side effect of this mentality, a further degraded and heavily polluted country of finite size. How long will it take for Japan's ecology to recover? We all won't be here by then. A group of us are reposting all of these articles on our Facebook to raise awareness. Please do the same...if you feel as strongly about this topic of nuclear energy. We need to shut down these poisonous plants and never let this happen, again! <3 to everyone in Japan! Ultraman, Arnie Gunderson recommends enenews AND EX-SKF to his listeners. He says that radioactive rain will continue in the US and other parts of the world for another year and he believes it is from the large scale burning of radioactive debris in Japan. "He hypothesizes that the radioactive rainouts in the US are being caused by major industrial burning of radioactive materials (straw, animals, etc) in Japan. This seems like a long shot to me. He also says there is still I-131 being detected around the reactors. Isn’t it possible that the reactors are still sending streams of radioactive steam or hot air high enough up into the atmosphere to travel across the Pacific?? What evidence do we have for large-scale industrial (pass the buck) burning? " IF YOU OPPOSE NUCLEAR POWER IN THE U.S.--GET UP, STAND UP--THERE IS A MEETING IN TENNESEE WE NEED TO ATTEND TO STOP A NEW PLANT FROM OPENING. Tell TVA that Bellefonte is a bad bet! The financial and safety risks are too great to move forward with the proposed Bellefonte project. TVA’s Board of Directors could approve spending billons on Bellefonte at their A...ugust 18 meeting in Knoxville, TN. Tell them to reject Bellefonte and instead invest in cheaper, cleaner and less risky energy options such as energy efficiency and conservation and renewables, including wind, solar and bioenergy. • Attend the August 18th Board meeting at the TVA Towers in downtown Knoxville, TN. Meeting starts at 8:30 am. TVA must do better. It’s time to put Bellefonte behind us once and for all! For more information contact Southern Alliance for Clean Energy 865.637.6055 or www.cleanenergy.org"
Many, many waste processing plants in eastern Japan have been burning garbage and yard waste from households, and the ashes are highly radioactive. Sewer sludge plants have been burning the sludge and the ashes and slag are highly radioactive. These plants are not fitted with filters that completely capture radioactive materials. Needless to say, these plants are not meant for radioactive waste, but they've been burning the ordinary garbage that is radioactive thanks to the accident. In Tokyo, the highest smoke stack is 210 meters, or 689 feet. As to radioactive iodine still detected in the plant, that's what the anonymous worker at the plant tweeted the other day, saying he would dare not switch to the lightweight masks that TEPCO is planning to introduce as part of the measures to prevent heat exhaustion among workers. Didn't know about mention of my blog by Gundersen. Thank you Mr. Gundersen. Wow...The fact that Arne Gundersen mentioned your blog in his latest interview podcast this weekend on SolarIMG.org (link: http://solarimg.org/?p=1722) is a real testament to your wonderful work, exposing the truth about the situation in Japan. The strengths of your blog are many. You are serving as a vital bridge of "truth in reporting" between Japan and the rest of the world through your posts in English. Keep up the important work! Please know that you and all the Japanese citizens are in our hearts and minds.